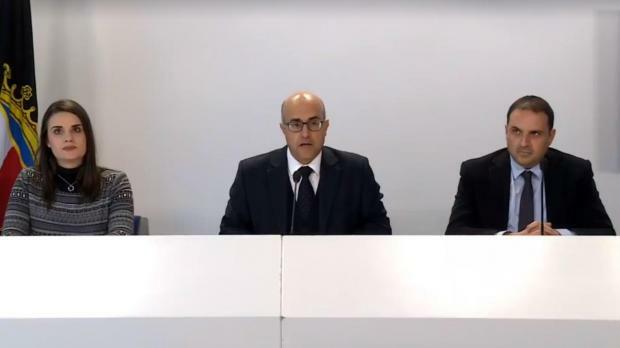 Environment spokesman Jason Azzopardi (centre) said a series of short-sighted decisions on construction waste had led to a crisis. The Nationalist Party is not opposed to land reclamation in principle, but is insisting that any projects are not driven solely by the amount of construction waste being generated. Environment spokesman Jason Azzopardi said on Tuesday that environmental considerations should be paramount in any eventual project, and that the government should first focus on better measures that reduce and manage the construction waste crisis. Land reclamation has risen up the agenda as the construction industry has sounded increasingly urgent warnings about the lack of facilities available for waste disposal. The Times of Malta has reported that one embryonic plan had earmarked an area off the Xgħajra coast as most suitable to a large-scale reclamation project. Addressing a press conference, Dr Azzopardi called for a long-term national strategy on construction waste, based on thorough studies including environmental impacts. He said a series of short-sighted decisions on construction waste had led to the industry and the environment both suffering. “The government opened the floodgates by making a conscious decision to base the economy on the construction industry without considering where the waste would go,” Dr Azzopardi said. Putting forward the party’s proposals, MEP candidate Michael Briguglio called for more schemes to conserve and restore existing buildings and measure to encourage greater reuse of demolition material. He also said developers needed a national facility where construction waste could be resold without undue burden, and schemes to encourage reconstituted stone which could then be exported as an economic resource. Dr Briguglio added that studies would have to determine whether such measures could reduce construction waste to the level where existing landfill capacity would be enough to cope with the remaining disposal needs. In a reaction, the Labour Party said it welcomed the PN's comments on land reclamation. "This is a step forward, it means there is broad agreement in the country on an issue of major importance," the party said. It hoped that when the country needed to discuss the next steps in this direction, the PN would participate constructively rather than sit on the fence as it had done in the debate on waste management.